If you live in an area that gets heavy to moderate snowfall, the last thing you want to be doing is fighting with a shovel in nose-icicle temperatures. You could always stay inside and hope that the city plow trucks won’t plow you in, or you could take control of the circumstances and have fun doing it with a Sno-Tek 920402 too. 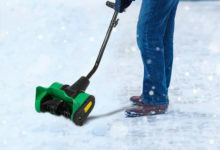 Snowblowers are designed to take the chore of shoveling snow and make it more enjoyable. Ariens generally specialise in high end snowblowers such as the Ariens Compact 920021, but for the Snotek 920402 they’ve have done their best to produce an affordable economy model that still provides value for money whilst maintaining functionality and reliability. Fortunately, not all snowblowers are expensive and the price can be dependent on whether you want all the extras too. Things like LED headlights, and heated handlebars, or even electric start, can all start to add up. Arien’s has a great reputation among consumers across North America. A simple scan of reviews online and you’ll see that this machine has great reviews and very few of them are rarely from disappointed customers. It was also featured in our top 5 list. The quality of the design and structure is fantastic, and it should be if you’re going to spend a significant amount on one of these machines. 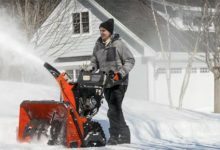 Ariens is known for taking the usual features you can expect from a snowblower and then adding a few extras. In this case, it’s a headlight and push-button start. 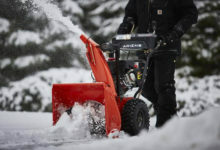 The Ariens Compact 24″ snowblower we’re reviewing today is not the easiest to learn, but if you give it a chance, we’re certain you’ll never regret picking up this workhorse. If you live in an area with low to medium snowfall, you could probably get by shoveling your driveway and sidewalk, but why would you do that when there’s a snow thrower out there that will take what you could do in hours, and scale it back down to minutes? We’re going to provide a full Toro Snow Master review to help you see the value in such a big purchase. There are some devices that you may have read about, yet never considered buying. Often, these are the very machines that can save you a lot of time. Snow is inevitable in many areas of the USA, and in some places, heavy snowfalls in winter are routinely expected. It’s beautiful to look out on a snow-covered garden when you open the curtains, but then you have to go out in it. Whether you need to clear the drive to get the car out to get to work, or the same to take the kids to school, or you need to clear the paths outside your house – which in many places is your responsibility – it’s no fun going out early on a cold, wet winter morning to shovel away all that snow manually. It’s uncomfortable, difficult and takes up more time than you have to spare. If you’ve read our reviews, you’ll know there’s a ton of choice out there. If you’re looking for a single stage blower only, we’ve compiled our list of favorites below. 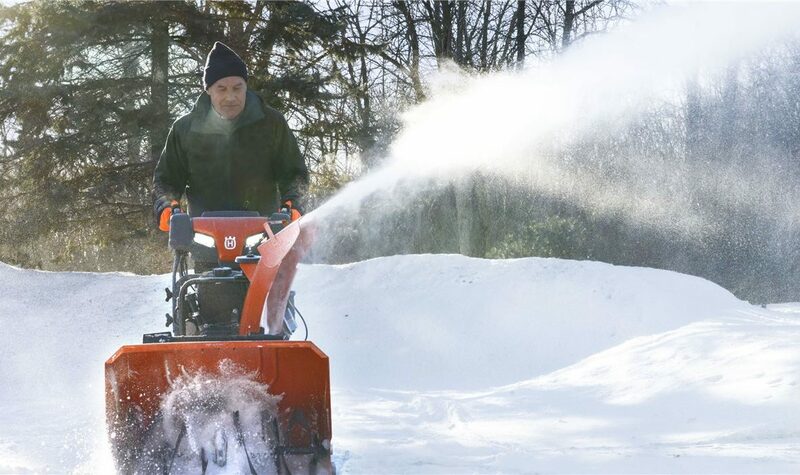 Let’s have a look at five of the best single stage snow blowers on the market. First on our list is this model from Power Smart, and it should be said it is one of the bigger of the single-stage models on the market. This one is built in the manner you would expect of a lawnmower, for example, with a pram-style handle that is adjustable for height. The motor is a 13-amp one that provides plenty of power to handle large amounts of snow. It’s fairly easy to handle but is not especially light, weighing some 37lbs, but it is very capable and if you have a large area to cover, is worth looking at. What can it do? 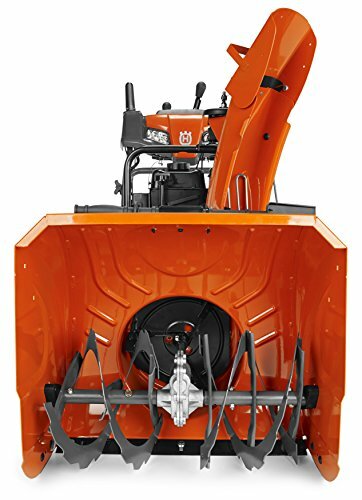 This model has an auger that can clear snow in 18-inch widths; this is a large area and as it can also remove to a depth of 9-inches, which depends on the size of the auger, is clearly a heavy duty model with some power. The blades are steel with rubber tips to prevent unnecessary wear, and the motor is a simple switch on and go design, with no need for cords to pull or priming. This is a big machine, one that will be very useful for people who experience medium snowfall, and worth the investment. 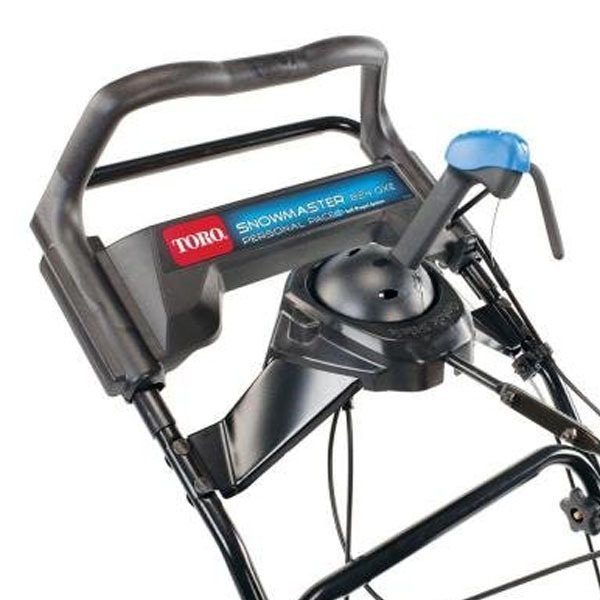 This is a gas powered single stagee snow from well-known brand Troy Bilt which offers a wide variety of snow blowers and throwers. It is powered by a 208cc petrol engine that puts out enough power for clearing a very large amount of snow, very quickly. Weighing in at a mighty 97lbs, and is specially equipped with a handle designed to make it easier to push and move, this blower is a beast. Where this one scores is in its capability, for it really is very impressive in action. Thanks to extra wide and deep augers, you can clear a width of 21 inches and up to a depth of 13 inches in one pass. That gives you the capability to clear a very large space in no time at all. The chute itself can be adjusted remotely and it can throw the snow 30ft away for great clearance. A push button electric start system means there are no problems getting this going and if you can handle it and want one of this type then you need to check it out, but it is expensive in comparison to some. Unique among our selections is this model from EGO Power, a company that offers plenty of equipment of this type and that has a strong reputation. 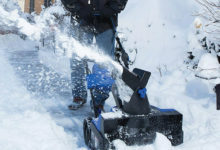 This model is unique because it is electrically powered but also a cordless snow blower: it has two lithium-ion batteries that you recharge and that gives you almost an hour’s running on a full charge. 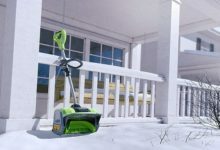 It is large – it is also heavy at around 90lbs – but it is very powerful, very capable and will easily clear a great deal of snow from your property in no time at all. 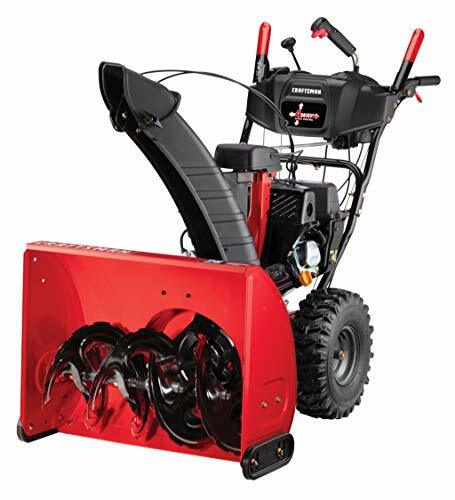 It has an auger that can clear 21 inches in width, and that can handle 12 inches in depth in one run, which means it can clear a large space – such as your driveway – in a matter of minutes. The handle is easily adjustable for height and is designed to be comfortable to use, and the speed of the auger can also be adjusted, with a maximum throwing range of 35ft. What is also impressive about this one is that it comes with a very fast charger: in less than an hour you can have a battery at a full charge which is very useful for those surprise snow showers, and it has headlights for easy working in the dark. Back to the gas powered models with this one, and it’s from Remington. This model features a 123cc engine with the much-appreciated electric start function so you don’t need to pull a cord, and is a nice model that is a smaller form than some of the others. However, it still weighs around 87lbs so is not lightweight, but it also packs some punch. This is another with the pram handle design and one that has been styled to be comfortable, and it is a fully adjustable one so you can have it where you like it most. The Remington offers a tough and durable auger that can clear a width of up to 21-inches and a depth of as much as 13-inches in one pass, so is very capable of getting your drive or garden cleared in next to no time. The chute is moveable by remote so you can choose where you want to throw your snow, and it is simple to start and stop. Also, 7-inch snow wheels make it very easy to get through heavy falls. This is one that may be good for anyone wanting a heavy duty model at a sensible price. In terms of size and weight, this one – at a mighty 107lbs – is certainly the daddy of them all. It’s also one of the best snow blowers here in terms of build quality and capability. From Ariens, its 208cc gas engine is powerful enough to give it considerable clearing power, yet it does take some moving given the weight. You get the usual style handle with all the adjustments and a chute that can be angled how you want it. In terms of what it can do it’s very similar to the others here: it offers 2 1inches of clearing width and 12binches depth, that’s in one pass. This one claims to have a design feature that means there will be no snow left on the ground, too, which is not always the case as a thin layer may remain. It can throw the snow up to 35 feet in any direction across the 210 degrees the chute can be rotated through, and it is fitted with snow wheels for ease of movement. In terms of price it sits bang in the middle of the range, so while not cheap is not the most expensive by far. The first point to make is that each of these five bar one offers very similar clearance width and depth; only the first one on the list does not clear 21 inches wide and at least 12binches deep. However, that one – from Power Smart – is one of only two electric models and is by far the cheapest here, so if you’re on a budget it may be the one. If you do want an electric model, we recommend you look at the EGO model as it is cordless, which does have many benefits. It’s also very powerful, but whether those benefits outweigh the quite noticeable added cost remains to be seen. So to our three gas-engine models, each of which does pretty much the same thing in terms of how wide and deep it can clear. 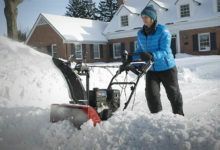 The Troy Built is a big and powerful machine, the Remington model perhaps the best value for money, and the Ariens – while impressive is very heavy compared to the other two. Our choice would be the Remington 2120 snow blower, but any one of them would do the job equally well. The choice is yours, so take your pick, and make sure you have a snow blower to make the winter easier! What Actually is a Single Stage Snow Blower? The concept of a snow blower is very simple: by using a set of blades and a motor, it scoops up the snow and throws it to one side, clearing you a path in the process. We’ll give you a little more detail in a moment, but a couple of points to clear up: you will read of snow blowers, snow throwers, and snow shovels. These all do the same job, in a very similar way, and are essentially the same thing, so don’t get confused. More confusing is the fact you will read about single-stage, 2-stage, and 3-stage snow blowers. As we are looking at five of the best single stage snow blowers, we’ll explain what that means, and then briefly tell you about the differences. How Does a Single Stage Snow Blower Work? 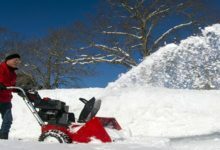 A single stage snow blower works like this: an electric motor or gas engine is used to turn an auger that is mounted low at the front of the machine. In a single stage blower, the auger is turned by the motor and the machine pushed along. The snow is picked up by the blades and pushed into a chute, from which it is thrown a distance out of the way. 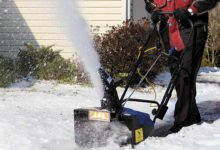 These are the simplest types of snow blowers, and also among the most popular. For the record, a two stage snow blower does the same job with the augers but features a system that blows the snow more forcefully through the chute, while a three stage model adds the extra feature of a device that also breaks up the snow, making it more efficient. You pay more for these, of course, and they are not always necessary. GAS ENGINE WITH ELECTRIC START: 4-cycle quiet Gas engine for maximum power, performance, and durability. 26-INCH CLEARING WIDTH: Clears snow up to 21 inches deep from your walkways and driveways. SELF-PROPELLED: Six forward and two reverse speeds with trigger-controlled steering allow you to control the pace of your work. ADJUSTABLE CHUTE: Customize the direction of the chute with the integrated remote crank. LARGE 15-INCH TIRES: Large treaded rubber tires with X-Trace rigid traction with skid shoes makes it easy to maneuver through deep snow. The winter months are those when we tuck up tight and warm and stay inside! Or, we could if we didn’t have to get up and go to work! Or, you might have to get up early to take the kids to school, and it’s a chore when there’s been snowfall overnight. Of course, snow is part of life in the winter – more so in some places than others – and there is nothing we can do about it, but it does cause many headaches. Winter is a season of two faces: the first is the picture-postcard one of great beauty, with glorious snow-scapes and Christmas scenes, warm and happy families in front of a glorious fire, enjoying the peace and quiet of an evening. Or, perhaps, a walk in the snow with the children, enjoying the delights of the winter weather, together and happy as one. Then there’s the other side of the coin: the cold, freezing winds, the horrific traffic hold-ups that a few inches of snow brings, the need to venture out in the morning after a night-time fall and clear the way. After all, life doesn’t stop for snow; we still have to go to work and earn a living. The winter months are closing in fast, and we can expect the usual heavy snowfalls that cause havoc every year. It’s a chore having to clear your driveway and paths every morning – and can be hard work with manual tools – but it needs to be done, and that’s why we recommend you consider buying yourself a snow thrower. You’ve probably seen the local authorities using one of these, or even a neighbour, and believe us when we say they make life a whole lot easier – and the ground you walk upon safer! So, what are these Husqvarna snow blowers all about, and can you afford one?